The number of children starting primary school has increased sharply since 2000, there are more girls in school than ever before and spending on education and aid has risen. That’s the good news, according to the sixth edition of the Education for All Global Monitoring Report released by UNESCO. But on the down side, poor quality, the high cost of schooling and persisting high levels of adult illiteracy are undermining the chances of achieving education for all by 2015. “We are steering the right course but as education systems expand, they face more complex and more specific challenges,” says Koichiro Matsuura, Director-General of UNESCO. 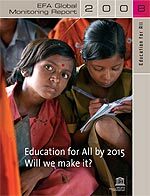 “The latest EFA report clearly identifies these challenges: reaching the most vulnerable and disadvantaged, improving learning conditions, and increasing aid”. The report shows that primary school enrolment increased by 36% in sub-Saharan Africa and 22% in South and West Asia between 1999 and 2005. Governments in 14 countries abolished primary school tuition fees, a measure that has favoured access for the most disadvantaged. Worldwide, the number of out-of-school children dropped sharply from 96 million in 1999 to 72 million in 2005. Countries where primary school enrolments rose sharply generally increased their education spending as a share of GNP. Public expenditure on education increased by over 5% annually in sub-Saharan Africa and South and West Asia, the two regions farthest from achieving Education for All. Between 1999 and 2005, 17 additional countries achieved gender parity in primary education, with equal numbers of boys and girls attending school. These include Ghana, Senegal, Malawi, Mauritania and Uganda; 19 reached parity at secondary level, including Bolivia, Peru and Viet Nam. As a result, gender parity in education was achieved in 63% of countries at the primary level and 37% at secondary in 2005. Aid to basic education in low-income countries more than doubled between 2000 and 2004 before falling back in 2005. In 2005, low-income countries received US$2.3 billion for basic education, up fromUS$1.6 billion in 1999. Fifty-three countries are in an intermediate position. In this group, participation rates in primary education are often high, but the EDI value is pulled down by low education quality or low adult literacy levels. In addition, based on projections from current trends, 58 of the 86 countries that have not reached universal primary education will not achieve it by 2015. Cost continues to limit access. Despite constitutional provisions in most countries guaranteeing free primary education, a majority of children in public primary schools face some type of charge, sometimes representing up to one-third of household income. Poor education quality is a global issue that is gaining increased policy attention. Among developing countries in particular, the challenge to improve quality involves addressing high drop-out rates, weak pupil performance, teacher shortage and insufficient instructional time. Although the proportion has improved slightly since 1999, less than 63% of pupils reached the last grade of primary school in 17 sub-Saharan African countries with data, while under 80% did so in half the countries of South and West Asia. In several African countries fewer than half the pupils who start primary school reach the last grade. Furthermore, national learning assessments from several developing countries find that up to 40% of students do not reach minimum achievement standards in language and mathematics. To cope with enrolment increases, most developing regions face the need to hire new teachers. Overall the world will need more than 18 million new primary education teachers by 2015. Sub-Saharan Africa, East Asia and the Pacific and South and West Asia will each require nearly four million new primary school teachers. Many countries in sub-Saharan Africa rely widely on contract teachers to fill the shortage. Sometimes accounting for more than 50% of all teachers, they typically receive less training and lower pay than their civil service counterparts. The report calls for policies to upgrade and professionalize untrained contract teachers and, in the long run, to integrate them into one career stream. The report regrets that national governments and donors have emphasized formal primary schooling at the expense of early childhood and adult literacy programmes. These programmes have a direct impact on achieving universal primary education and gender parity, and more broadly on poverty reduction. Children from the poorest backgrounds are those who stand to benefit most from early childhood care and education programmes. Despite measures in many countries to expand access to pre-primary education, participation levels remain below 20% in the Arab States and sub-Saharan Africa, and under 40% in South and West Asia on average. Governments, the report finds, are also neglecting adult literacy: worldwide 774 million adults – nearly 1 in 5 - lack basic literacy skills. More than three-quarters live in only 15 countries. Women’s literacy in particular has a strong influence on a child’s education and health yet they still account for 64% of adults who are not literate worldwide. On current trends 72 out of 101 countries for which projections were calculated will not succeed in halving adult literacy rates by 2015. External financing for basic education remains far short of the US$11 billion required annually to reach EFA in low-income countries. It is insufficiently targeted to countries of sub-Saharan Africa and to countries facing conditions of fragility. France, Germany, Japan, the United States and the United Kingdom are the five largest donors to education but the first three allocate less than one-third of their education aid to the basic level. The report states that too many donors are putting excessive priority on post-secondary. Most countries that have achieved EFA or are close to doing so are in North America and Europe but this category also includes Argentina, Brunei Darussalam, Bahrain, Mexico and the Republic of Korea. Norway tops the Education for All Development Index followed by United Kingdom, Slovenia, Sweden, the Republic of Korea and Italy.